"Sometimes everything seems just like a dream. It's not my dream, but somebody else's that I have to participate in. What happens when the one who dreamt us wakes up and feels ashamed?" Jan (Max von Sydow) and his wife Eva (Liv Ullmann) have lived a fairly bucolic life on a small, isolated island since the orchestra they both played for was dissolved years earlier. The lingonberries they sell don't bring in much money, but they are happy and enjoy a loving, playful relationship, despite the threat of impending war. It arrives with a vengeance when planes suddenly fly over their small cottage on bombing runs, and one of them crashes and explodes. They run to help the pilot, who has ejected and is dangling from his parachute in a tree, but it's too late and they are suddenly surrounded by soldiers. Director/writer Ingmar Bergman paints a powerful portrait of war and its effects on ordinary people in Shame, his only film to deal with the subject. Although it's a war film, by no means is it typical of the genre, and there are few scenes of bombs and destruction. Bergman is not interested in dazzling us with pyrotechnics and spectacular battle scenes; rather, his concern is the impact of the war on the lives of everyday citizens, and how their perceptions of and reactions to the carnage around them affect their lives and personalities. In Bergman's war, all is ambiguity. Neither we as the audience, nor Jan or Eva, know what the war is about, the reasons why it is being fought, or what its possible outcomes are. There are two opposing sides, as in every war, but their goals remain unstated and unexplained. One side calls itself the 'liberators', but from what? Eva and Jan are essentially cut off from any news of the outside world�their only source of reliable information, their radio, doesn't work. But Bergman makes it clear, by not privileging the audience with any more information than Jan and Eva have, that this is an ideologically neutral film, which doesn't care about who is "right" and "wrong" in abstract terms, but simply condemns war, all war. If war isn't about good winning out over evil, then why is Bergman so strongly opposed to it? Simply because of the harm it can do to those who are caught up in it, with little or no power to influence events. In one of the supplements, Liv Ullmann expresses her opinion that the real victims of war are civilians, who are caught up in a hell that they can't understand, and Bergman seems to echo her thoughts here. Eva, who is first seen as full of the joy of life, becomes embittered and hard, but the effects on Jan are far more striking. Although he is portrayed initially as being somewhat weak (a typical 1960s Bergman male), what follows is worse, as he becomes cynically and cunningly self-centered, a man who is capable of murder if it means his own survival. But a Bergman war film is still a Bergman film, even if its subject matter is so removed from his usual concerns. In the mid-1960s, he had exhausted his exploration of the theme of a distant and uncaring God, and the only religious elements in Shame are church bells, which are first noticed, then ignored, by the couple, and some fairly obvious visual references to crosses. In keeping with his gradual shift towards examinations of female characters, he here privileges the reactions of Eva, although the Jan character is still the primary motivator of events. Liv Ullmann gives a magnificent performance. In contrast to her first two roles with Bergman, where she was treated more as an icon, a symbol, she is here allowed to bloom, and her character comes through beautifully, first as the nurturing, caring wife, and later, as the survivor of horrific events. In the early parts of the film, Ullmann is vivacious and full of joy in her happy relationship with Jan, but when the darkness of war descends, she portrays equally well the distress and revulsion that Eva feels. Equally good is Max von Sydow in a considerably less sympathetic role, first as weak and self-centered, later as manipulative and dehumanized. And Bergman icon Gunnar Bj�rnstrand is wonderful as the town mayor Jacobi, dominant and manipulative of the couple, yet fully aware of and resigned to his inevitable fate. If there is one discordant element in the film, it's the abrupt shift in the relationship between Jan and Eva once they have had their first direct experience with the violence. They are at first portrayed as affectionate and loving, not in a saccharine way, but realistically, with the occasional barbed comment, just as quickly withdrawn and apologized for. But once the region has been pacified, they are suddenly at each other's throats, and their bitter and venomous comments (Eva says that at least they were nice to each other during the war) seem disproportionate to the relatively benign events they have experienced. Granted, they are living under difficult conditions, and subject to the whims of their benefactor Jacobi, but the 180 degree shift seems artificial and is extremely jarring. 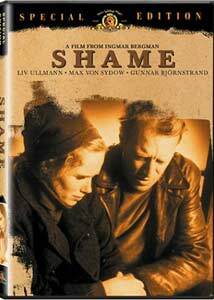 Despite the English title Shame, the Swedish title is more accurately translated with the definite article as "The Shame," which begs the question of what specifically Bergman is referring to. There's certainly plenty of shame to go around�Jan's initial weakness and later revoltingly self-centered behavior, for one�but it's obvious that for Bergman, the ultimate shame is war itself, and the horrific effects it has on those least-prepared to deal with its immediate effects and long term consequences. Image Transfer Review: This is quite a good transfer, with deep blacks and the rare bright whites coming through clearly, allowing cinematographer Sven Nykvist's careful lighting to shine. There is occasional grain, but this is only distracting in one or two scenes. There are no compression artifacts, and a welcome lack of edge enhancement. Audio Transfer Review: The mono sound is limited in range, but never sounds harsh or strident, and is fine for a film of this vintage. Extras Review: Bergman biographer Marc Gervais provides a commentary track. As a film professor and Jesuit priest, he's well positioned to interpret and explain Bergman's work. He talks about the structure of the film, with its undramatic opening scenes providing counterpoint to the horrors to come, the rituals of everyday Swedish life and how they are shattered, the deliberate confusion that Bergman creates in several scenes, and comments on Liv Ullmann and her dedication to UNICEF. While his comments are interesting, too often he lapses into a simple description of what's happening on the screen, and the results are mixed. Surprisingly, he offers no interpretation of the use of church bells on the soundtrack, and his comment that a disturbing scene of a doctor flippantly examining the injuries of rounded-up prisoners is "just the doctor doing his job" is bizarre. The 18m:34s In Search of Humanity documentary consists of intercut scenes from the film, snippets of an interview with Liv Ullmann, comments by Marc Gervais, and, in common with the rest of the discs in MGM's box set, segments of a 1970 Canadian Broadcasting Corporation interview with Bergman, which are only marginally related at best. There's not a great deal of interest here, although Gervais places Shame in the context of Bergman's other "personality disintegration" films of the 1960s, and Ullmann contributes some interesting comments on the conditions of making the film, and the questionable claim that it contains Bergman's only improvised scene. In the brief (3m:49s) interview with Liv Ullmann, recorded in 2002, she discusses her working and personal relationships with Bergman. The US release trailer (which somehow misspells Liv Ullmann's name) is presented in a good transfer, although the source contains scratches and speckles. The photo gallery is duplicated on the Supplemental Materials disk, and contains a shot of the film's poster, as well as 43 production photos. In one of his few excursions into genre film, Swedish director depicts the horrifying consequences of war on those least prepared to deal with its dehumanizing effects. The performances are excellent, and the quality transfer and reasonable extras add up to a worthwhile package.